Wow, what a wonderful break. I REALLY needed that. 2011 was intense and we all need to rest, right? Sometimes when you work for yourself, it's hard to take time off...it's funny actually, because I tout that as one of the benefits of working for myself, being able to take a day off whenever I want, and yet, it seems I am less likely now than ever to give myself a break. Over the last 5 years though, I have overworked myself many times and it never seems to pay off, so I am getting better at it. 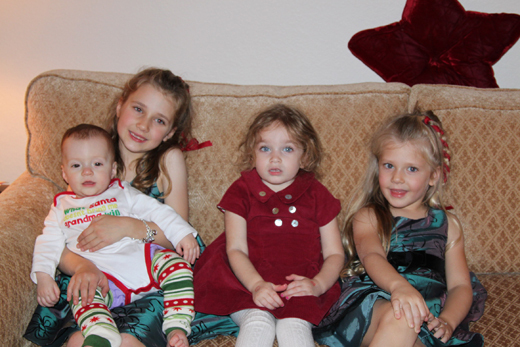 We had a lovely Christmas, it was very enjoyable to watch Ruby experience it now that she is almost three. I was a little worried about the abundance of presents and her getting greedy, but we didn't have much of a problem. 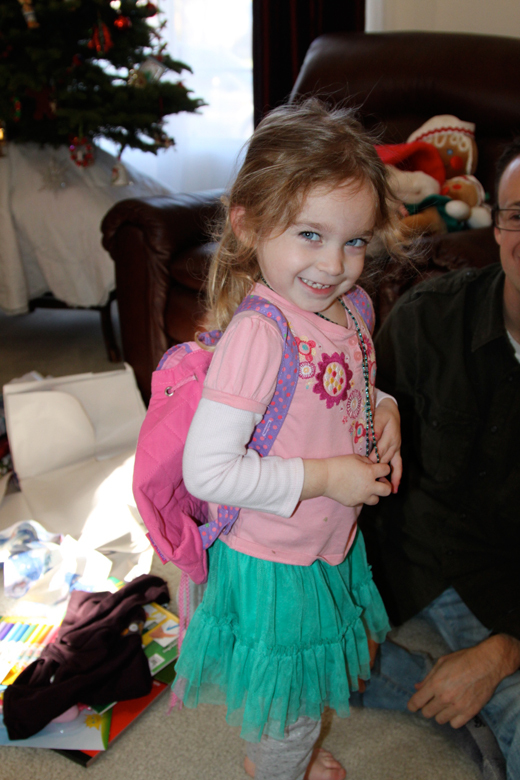 She got a lot of practical gifts, which were great, like this backpack, so she can carry her own stuff around. Yay! My little girl is getting SO big! I had a lot of moments like this over the break, where I was just astounded by Ruby's maturity. She is so articulate, opinionated and smart. This can be challenging, but it brings me joy at the same time. I've been having this weird realization over the last year or so, that I am old! I'm not complaining, it's just weird to be so grown up. How did this happen? These girls with Ruby are my cousin's children. We have now taken the place of our parents and they are the Grandparents. I guess time just keeps going by, it won't be long before I'm the Grandparent and I'm asking, how did I get HERE? One of the things I was pretty excited about this Christmas was a new tradition we started. We're going to let Ruby choose a gift for Jesus every year, since it is, in fact, his birthday. 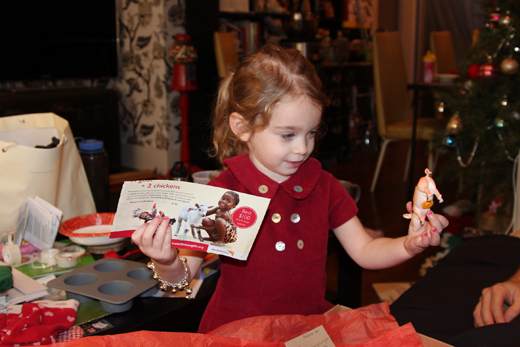 This year she chose to give Jesus a gift through World Vision. They have this great catalog where you can pick out animals and other things to give families in need around the world. She chose a pig, so we bought a pig that will be given to a family and will have up to 20 piglets a year that can be sold and/or eaten for food. I found a little plastic pig in the dollar bin at Target that we can keep as a reminder of our gift. I'm just in love with this little girl! Sometimes I blame her for not being able to do more with Salvage Life or take it to the next level, but these last few weeks I spent with her without trying to get much else done, were a wonderful reminder of how enriched my life is and how relationships are the most important part of life. I hope you enjoyed your holidays as much as I did! Wonderful post! I love the picture of the girls at your parent's house. Finding balance is so difficult. I'm hoping to make tahat a priority this year too. Aww Ruby is adorable! I'm not religious at all but I LOVE the idea of buying a useful gift for somebody who really needs it through World Vision! I think that's a tradition I might start adopting too. someone i met on etsy, who has a couple of shops and older kids - high school - told me not to worry about not having time to create. that i'm busy creating experiences and memories for my son. so no worries - spend time with Ruby!